Monday, October 6, 7:15 p.m., WTF, Shoppingtown Mall. The evenings are getting cooler, the days are getting shorter (say it ain’t so, Joe) and the trees are changing colors. Fall is actually is my favorite time of year. I love the cool, crisp temperatures and the beautiful colors. I love apples and pumpkins and putting on an extra layer when I go outside; who wouldn’t? Knowing that we are now in October means one thing–theWinter Training Facility (WTF) will be opening soon. The WTF officially opens for the season on October 27 (see details below). The days and times of classes are also listed. Similar to last year, we are allowing you to store your bikes at the WTF for the winter season and we have the space to store up to 40 bikes. This year we have established a new policy and will charge $20 for the storage of your bike throughout the season. If you would like to store your bike, we will be having an open house the weekend of October 25. The bike storage is on a first come, first served basis. We will send out a notice as we get closer to the weekend with more details regarding the time we will start storing bikes. Stay tuned for more details. Have a fabulous October and I hope we see many of you onOctober 27 when the doors of the WTF open! Thanks to everyone who sent me their awesome finishes. You are all rock stars! ITU World Triathlon Grand Final in Edmonton, Alberta, Canada, 11th place AG in the Olympic distance. 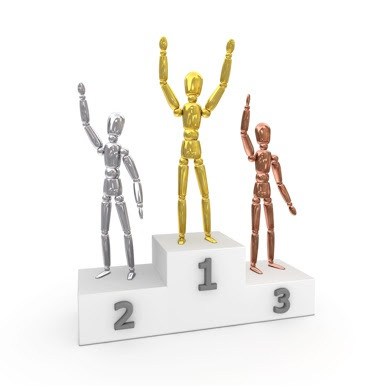 If you want to be recognized for your podium finish, please send details to newsletter@cnytriathlon.org. The CNY Triathlon Club Winter Training Facility (WTF) provides a unique venue for wintertime training. The WTF is located in the Community Wing in Shoppingtown Mall. The space is equipped with 50 Kurt Kinetic trainers, sound system, two large screen video monitors, projector and CD/DVD player. Bring your bike, water bottle, towel and your desire to have a great workout. 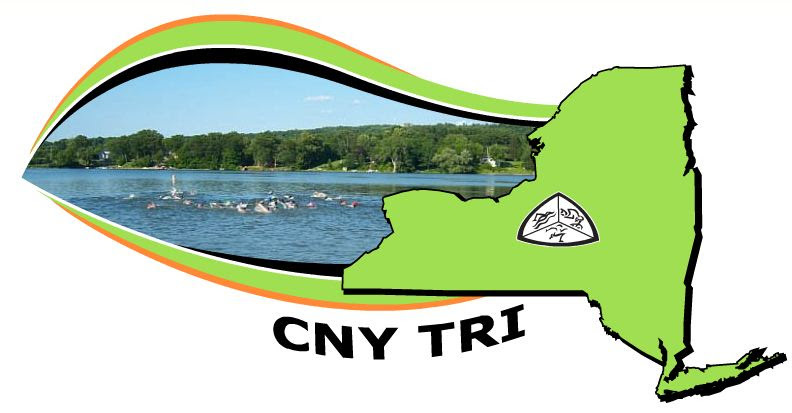 The CNY Triathlon Club Winter Training Facility is available for use free of charge to current* members of the CNY Triathlon Club. *Registration for 2015 club membership is open! Membership is good for the calendar year (January 1 to December 31). 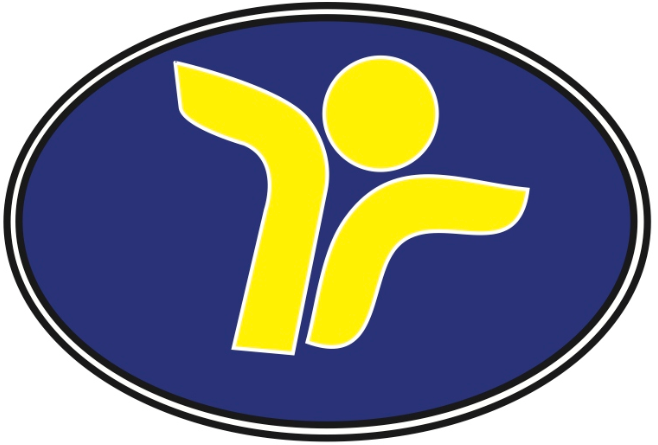 If you are a current member, your membership will expire on December 31 regardless of when, during 2014, you registered. If you register/renew now for a 2014 membership, you are a member until December 31, 2015. You can park in the parking garage by Sears and enter the mall at “entrance #6.” Walk your bike down the side hallway around (don’t go up the escalators) to the WTF, which is located in the “Community Wing” of Shoppingtown Mall. When the parking lot is wet or snow covered, carry your bike up to the mall entrance and roll your bike the rest of the way to the WTF. We want to keep the trainers corrosion free. If you have never used a bike trainer, no worries! It is easy and the leader of the session will show you how to set your bike up. NEW POLICY THIS YEAR: If you do not have a trainer at home and plan to use the WTF frequently, you can leave your bike at the WTF for a small fee of $20. Space is given on a first come, first served basis with a max capacity of 40 bikes. At the end of the season you can pick up your bike to get outdoors! Note: The CNY Tri Club is not responsible for items lost or stolen that are being kept at the WTF. It is also the responsibility of the member to pick up their bike during open WTF hours. Bring your water bottle pre-filled from home because water isn’t available at the WTF. If coming to yoga, bring a mat, but there are mats available at the WTF. The WTF does have a few small changing areas. Be sure to sign in at the front table for each session. Arrive 15 minutes early to set up your bike. Check the Club Calendar on our website for cancellations. Subject to change. Check website and club calendar for updates. Cycle with Sam Sampere. Get there early because Sam’s class fills up quickly! Sam will provide you with a great workout, but also a few laughs! Tuesday 6 p.m. Yoga with Lisa Baker. Lisa will teach a class that will keep you strong and centered throughout the winter. Cycle with Rich O’Neil. Rich will start with base building in November, December and January. Starting in February, Rich will pick up efforts to get you ready for outside riding. Bridget Lichtinger will start your Saturday morning off with a 30-minute core workout to get everyone strong and ready to ride. At 9 a.m., we will start riding! 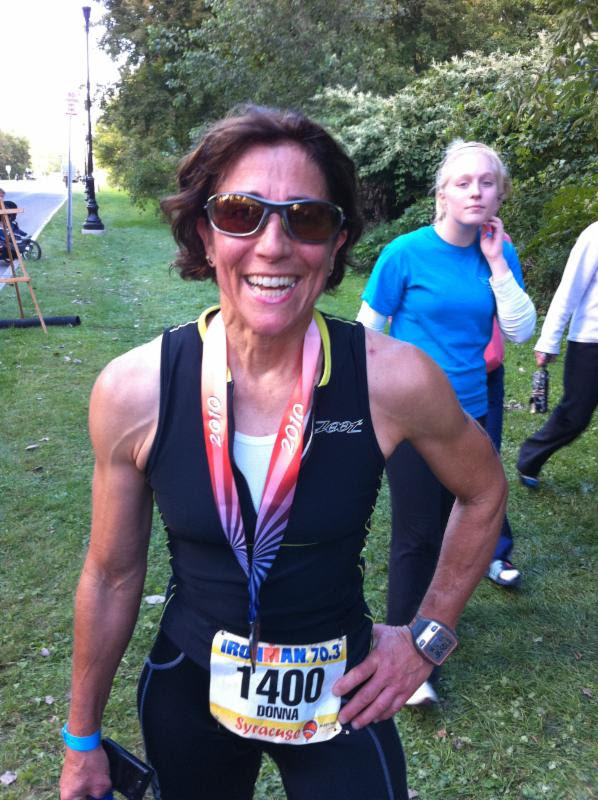 Bridget will give you a great weekend workout to get you ready for race season! Extended rides will begin later in the winter season. Check back as classes may be added throughout the season. Tell us about yourself. I turned 55 this year. I have lived in Central New York my entire life, now living only three miles from the farm where I grew up. My little slice of heaven on earth is on Gates Road, west of Baldwinsville, where my husband and I live and work. We own and operate Merritt Seed Company and just recently started Merritt Apple Orchard, which is now producing apples. Being self-employed is hard work. I guess you could call me a bit of a workaholic. I believe in working hard and playing harder. 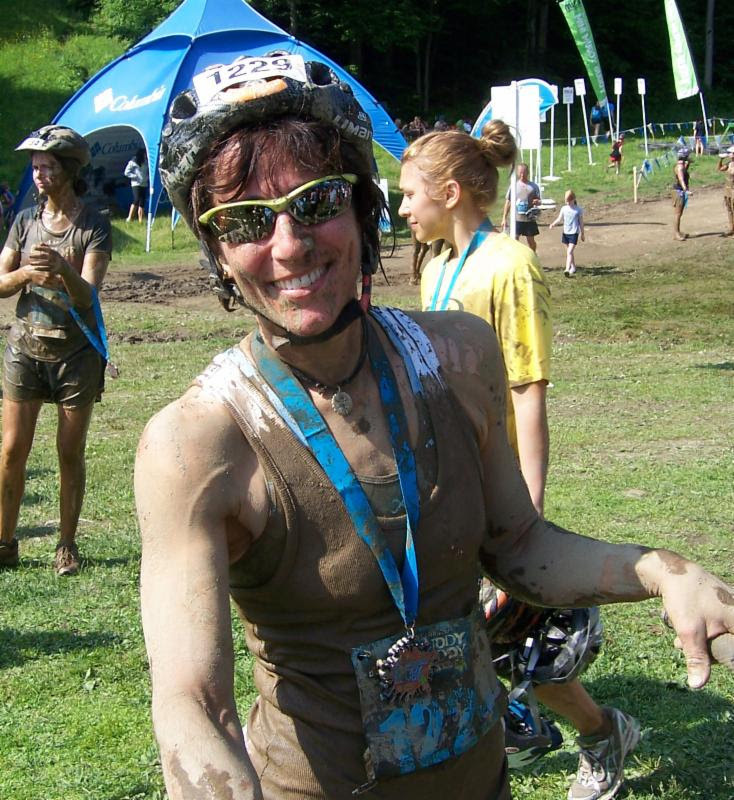 Besides my love for triathlon, I love participating in mud run obstacle courses like Tough Mudder and Spartan races. I love mountain biking and trail running. I love to travel and I have been very fortunate to have traveled all over the world. My favorite sayings are:Dream It…Do It…I Did….and continue to…Life is Good! and Have Passport, Will Travel! How long have you been involved in triathlon and what made you take it up? My husband was an avid sheep hunter and I used to go along with him on all his hunts. Sheep live high in the mountains so hunting them involved a lot of hiking and climbing. When his knees went bad he stopped mountain hunting and I needed another outlet to focus my energy on. With a seasonal business, in 2006 we I started going to Florida for a couple of months to escape the winter and there I had time to swim and bike to my heart’s content. One day I thought if I took up running I could do a triathlon. So I started running. I did my first triathlon in 2008. My big sister Pat. She is a true big sister that I look up to and admire. She is my best friend and biggest cheerleader. No matter what is going on in my life she is supports me 100%. She always has my back. I was very athletic growing up in the country as a middle child with three brothers and two sisters. In high school I was a diver on the swim team, competed all around in gymnastics, played field hockey, ran hurdles and did the shot put in track. I was voted Most Athletic my senior year in high school. After high school I really didn’t participate in any sports. Over the years I kept pretty active with work and did a lot of hiking and non-technical mountain climbing. 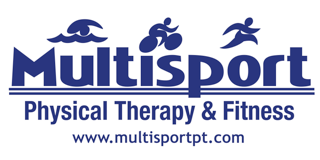 What are your triathlon strengths and weaknesses? I think my biggest strengths are my strong will, mental determination and a never-quit attitude no matter how hard the going gets. My weakness is that sometimes I underestimate my ability and don’t push as hard as I could. What was your first triathlon and what do you remember most? 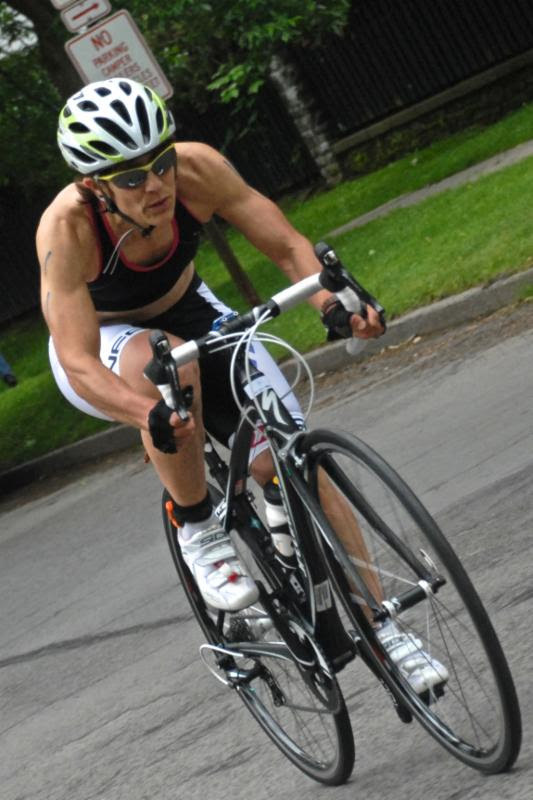 It was a sprint: Tri-America in Brewerton in 2008. I remember feeling like I could take on the world after crossing the finish line. e races are the ones for which I have trained properly, executed properly and the stars align to make it feel like a perfect race. If I had to pick just one I would have to say it was the Cape Argus Cycle Race in Capetown, South Africa in 2013. The 67.5-mile mountainous route circumnavigated the Cape Peninsula on completely closed roads and offered beautiful cliffside ocean views while riding. With over 31,000 riders completing the course it is one of the largest single day cycling events in the world. What was your worst race and why? I can’t say as I have ever had a worst race. I have, however, had one really scary race moment. During Ragnar Key West in February on my very first leg of the relay I set off at too fast a pace on a 7.5-mile leg in the dark on an unfamiliar course with no fluids or nutrition. I barely remember rounding my last turn at mile 7.2, seeing the lights of the exchange in the distance. I made it to the exchange, stumbling in on auto pilot using dogged determination. Tara, our team’s next runner, had to grab the slap bracelet off my wrist because I was out of it, I was within a hair’s width of heat stroke. I thought my quest to reach Key West was over without making it out of Miami; it took well over an hour to start feeling normal again. I learned a very important lesson about proper hydration and nutrition in humid conditions and to never, ever, no matter how fit, trained or prepared I think I am, go out on a long run, ride or swim without proper supplies. What races are on your calendar for 2014? This year has been pretty full. 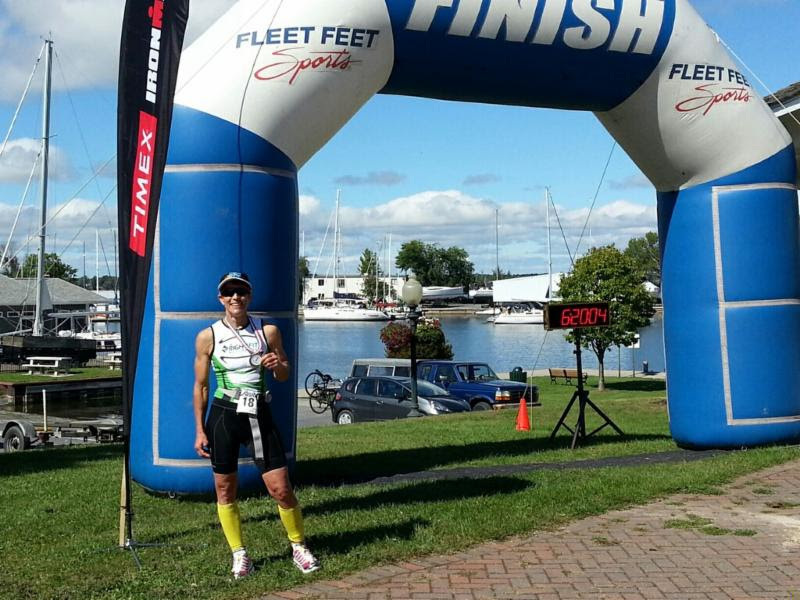 I did the Green Lakes YMCA Tri, Tinman Tupper Lake 70.3, Iron Girl, Xterra Off Road Tri at Green Lakes, Skinnyman and most recently back-to-back 7 0.3s at Incredoubleman in Sackets Harbor in September (photo at top). In addition to triathlons, I mixed things up with Ragnar Key West, Tough Mudder Buffalo, Point to Pint Century Ride and I’m All That! I have one race left on my calendar: Ironman Western Australia, December 7. What are this year’s goals? This year’s A goal is to complete my first Ironman distance tri, Ironman Western Australia. When I first signed up, my goal was to merely finish even if it meant crawling across the finish line in 16:59:59. I enlisted Karen Allen-Turner to coach me knowing with my busy schedule I would not be able to train properly on my own. I would need someone to make me accountable. As part of my training she suggested I sign up for Incredoubleman in Sackets Harbor this year. Completing back to back 70.3s on consecutive days would be a good test of stamina as well as a confidence builder for Ironman. I was able to put together two consistent races: 6:17:56 on Saturday followed by a 6:17:54 on Sunday and was the first overall woman finisher for the two-day combined time. Now I am actually setting a goal time, no longer competing to finish but actually competing to race. It’s a neat feeling to see how proper training has changed my perspective on the race. In five years you hope to: Still be Dreaming It and Doing It! And enjoying life to the fullest. Something most people don’t know about you. I bungee jumped off the Victoria Falls Bridge in Zambia, over 300 feet, with Victoria Falls roaring behind me and the Zambezi River flowing below. I felt like an eagle soaring! OK, so now you know I’m a bit of an adrenaline junkie, within reason, or maybe not. Zip line, anyone? What triathlon has taught you. It has taught me how strong a person I am. It has also taught me not to judge a book by its cover and that everyone has a story. I see so many different types of athletes in all shapes and sizes and ability and fitness levels that compete in and complete triathlons. I am in awe of each and every one who gets out and just “tri’s.” I hope they all know just how strong they are or can be. Being a member of the CNY Tri Club and taking part in the sport of triathlon has given me so many opportunities to learn and grow not only as a triathlete but as a person. The postings I have been putting on Facebook offering Apples for Athletes at discounted prices to members of the CNY Tri Club is my little way of giving something back to a sport which has given me so much.